Blend the spinach, basil, Parmesan cheese, garlic, salt, pepper, lemon juice, lemon zest, and 2 tablespoons olive oil in a food processor until nearly smooth. BASIL is part of the mint family. 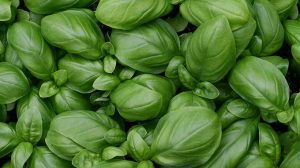 BASIL is rich source of vitamins A, B6, C and K and minerals such as iron, manganese and magnesium. BASIL can grow 12 to 51 inches in height. BASIL is an herb that is used mostly to cook with.